North Carolina is not a state I’ve spent much time visiting, except for Asheville. So, when I found out I would be spending 4 days in Raleigh, I was not sure what to expect. Well, what a pleasant surprise to find a clean, young, and vibrant city filled with gentrified areas, tons of restaurants, and culture to spare. And I also found there was no shortage of fun things do in Raleigh. Wow, talk about impressive. The North Carolina Museum of Art is amazing. 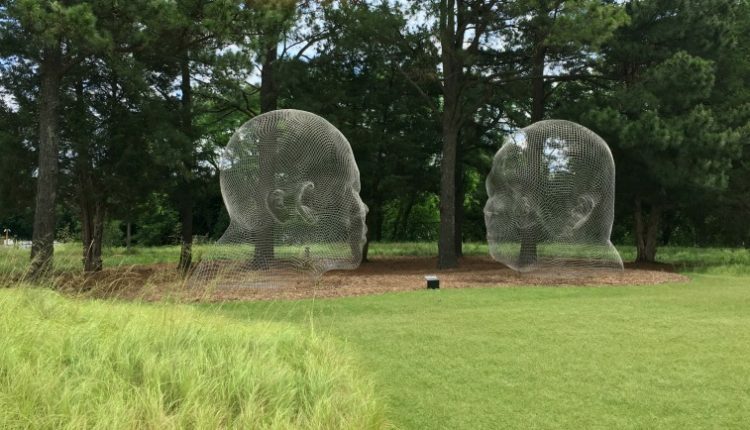 One of the premier arts museums of the south, it features not only an world class art collection, but an outdoor park with works of art, trails, and an outdoor live music venue. The permanent collections include ancient Egyptian artifacts, renowned European Old Master paintings, African and Judaic works of art, a huge collection of sculptures by Rodin, along with innovative contemporary art. Truly a not miss and it’s free. You can even shop and dine while visiting. The grounds of North Carolina Museum of Art. I wasn’t expecting much out of a local history museum, but ended up spending several hours taking everything in. The museum preserves local, state, and regional history. One of the more popular permanent exhibits, The Story of North Carolina, traces life in NC from its earliest inhabitants through the 20th century. You can see stone tools dating from 12,000 to 1,000 BCE, a real cannon that was recovered from Blackbeard’s flagship, a full-size replica of the 1903 Wright Flyer airplane, a lunch counter that played a pivotal role during the Civil Rights Movement, and much more. So much to see at the North Carolina Museum of History. The current exhibit that we got to view was on NC and World War I. They had videos, created bunkers, and had artifacts on display from the war. But what was probably most fun was the NC Sports Hall of Fame featuring exhibits and memorabilia from multiple sports. The museum is free. I loved CAM. There were no permanent exhibits, but when we visited, there were 3 special exhibits. Painting the Roses Red by Margaret Bowland kept us enthralled while we read the detailed description and inspiration for each painting by the artist. The Long Sun by Anne Lindberg was a unique visual experience. The museum is known for its cultural experiences, and bold, non-traditional exhibitions by living artists. The current exhibit by Margaret Bowland at CAM. Raleigh has the most concert dates, venues, bands and genres that any music fan can hope to find. Visitors can find a show every day of the year at the large scale arenas, such as Coastal Credit Union Music Park at Walnut Creek and Red Hat Amphitheater or at smaller or mid-sized concert halls such as KINGS or The Pour House Music Hall. You can check out the up-to-date calendar here. Outdoor lovers can use 22 miles of hiking trails, 13 miles of bridle or mountain bike trails, camp, fish and paddle all within the nearly 6,000-acre urban recreational area. And the park is located only 15 minutes outside of downtown Raleigh. You will also be happy to share your outdoors experience with an abundant of wildlife! If indoor rock climbing is your thing, then the state-of-the-art indoor climbing and fitness center, Triangle Rock Part, is a must visit. It features both lead and top-rope climbing, expansive bouldering terrain, and a comprehensive fitness area. There are locations in North Raleigh and Morrisville, which has the largest and tallest climbing structures in the surrounding five states. It also includes 100 climbing lanes and walls spanning to 55 feet. Photo credit Triangle Rock Park. While we were visiting, national baseball championships were going on, a dance competition, and an Ironman triathlon. Raleigh offers it all from baseball to hockey to professional soccer. Plus, with multiple universities including North Carolina State, you have tons of options to choose from. PNC Arena. Photo credit Visit Raleigh. Here are 3 ideas that will provide unlimited fun things to do in Raleigh with the family. The kids will love spending hours in Pullen Park and so will you. With its amusement rides, kiddie water boats, and “Andy & Opie” statue, the first public park in NC hosts thousands of visitors throughout the year. The Gustave A. Dentzel Carousel was originally installed in 1911 and is now listed on the National Register of Historic Places. The North Carolina Museum of Natural Sciences is the southeast’s largest natural history museum and North Carolina’s most popular attraction. Not only does it have a Nature Exploration Center and Nature Research Center, where you can watch research scientists and get inspired by the field of study, but you’ll find four floors of exhibits, live animals, and gift shops and cafés. And if that wasn’t impressive enough, it’s also an affiliate of the Smithsonian Institution. Oh, did I mention it’s free! North Carolina Museum of Natural Sciences exhibits. Photo credit Visit Raleigh. Make a trip with your little ones (kids ages 10 and under) to experience Marbles. From the world’s first and only kid-driven smart power grid to hands-on STEM learning stations, Marbles educates and inspires children. The museum offers themed exhibits designed to build imagination through self-led exploration of new ideas and experiences. Furthermore, you can also take in a movie at the Marbles IMAX, boasting North Carolina’s only 3D-capable giant screen. With more than 350 beers on tap, the Raleigh Beer Garden has the world’s largest beer selection, made official when representatives from Guinness World Records visited in 2015. Located in downtown Raleigh’s Glenwood South entertainment district, the venue has plenty of outdoor space, including a rooftop “garden” with seating that makes it the perfect warm-weather hangout. And if you’re hungry, a full dining menu includes everything from handcrafted pizzas to cheese and charcuterie plates. Photo credit Raleigh Beer Garden. The Raleigh area is home to over 25 breweries. From Wake Forest to Raleigh to Holly Springs and Fuquay-Varina, barstools await you. If you like giving a variety of breweries a try, the Raleigh Beer Trail is designed for you. Take your own brewery tour with the Raleigh Beer Trail. Since many of the breweries will provide free tours to visitors, you can learn the difference between beers like porters and dopplelbocks and sound like the beer connoisseur when you get home. What are your must-do’s in Raleigh? Indeed, there are lots of awesome things to do in Raleigh. My family loves to visit the North Carolina Museum of History to bond with the kids. Hope you enjoyed your stay. We were very pleasantly surprised with how much there was to do and the quality of the restaurants. We’d go back in a heartbeat!